So ~ you want to be close to the waterfront in Old Town Manteo? Then, welcome aboard private yacht " STARRY BANNER ". This award winning vintage yacht was privately commissioned to Tiffany Yachts to cruise the Atlantic Coast. The Starry Banner is now available to our guests, for their accommodation, who would like a unique vacation experience. Join us ON the waterfront, in the Historic Old Town Manteo Waterfront Marina. The Starry Banner was featured on the Manteo Christmas homes tour in 2014! Then, in 2015, the Starry Banner won " Best Power Boat – Owner Restored" award in the Manteo Wooden Boat Show. Why don't you be the judge ~ welcome aboard, and enjoy all that the wonderful town of Manteo and Roanoke Island has to offer right at your own dock! why not be on the water!!?? 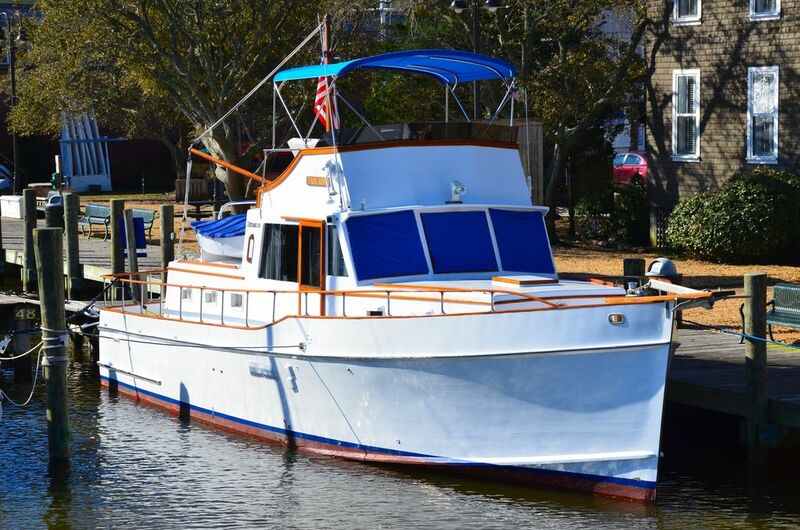 The Starry Banner is a beautiful yacht for accommodation only and will remain at the dock in Manteo at all times during occupancy. We celebrated our 30th anniversary on the StarryBanner and enjoyed it thoroughly!! Our 12 year old golden retriever also joined us ... very easy on and off. Loved the little town of Manteo , walkway along the marina , and fabulous sunrises!!! The Starry Banner was very comfortable and the owner was incredibly attentive to all our needs!! We highly recommend!!! Staying on the Starry Banner is a real treat. Nothing has been overlooked and the entire experience from reservation to checkout was perfect! Sharon is a delight to work with and very caring and thoughtful. We can not wait to return for another trip to Manteo and this sweet spot! Thank You so much!!! This was my first experience of sleeping on a boat—like a tree house rocking in the water! Well appointed, clean, pretty, and comfortable. The owner was immediately accessible both electronically and in person for help with any issues or questions. Comfortable bed and stateroom, colorful neighbors, excellent location! Manteo is a gem. Extra stars for being pet friendly. Our dog was initially unsure but adapted to getting off and on the boat eventually. People are very friendly around boats— what an experience! We have just returned home from the Outer Banks the last week in July. When we came home and our friends and family asked us "how was your vacation" my husband and I Steve both could only say "it was one of the best vacations we have been on" and we contribute this to accommodations and the hospitality we received during our time on The Starry Banner. Sharon from beginning to end was amazing, and one call away if we needed anything. The neighbors on the dock were warm, welcoming and helpful if need anything as well. We had a lot of rain during our week but thanks to our new dock friends(that we plan to continue to keep in touch with...)and the comfort and convenience of the yacht and all of the special touches Sharon has added, we didn't care that it rained.! Manteo has everything to offer right in walking distance, around each and every corner you will find something new and exciting to uncover during your stay on the Outer Banks. I am going to recommend The Starry Banner to my friends and family; and no kidding- my husband and I are so looking forward to going back we have already made our reservations in November this year to return and celebrate our anniversary. It's that special of place- 5 stars really isn't enough. Location ! and Setting is so much MORE than I could have envisioned ! My overall experience was pleasurable from the beginning. The Marina is quiet and has such a view ! The Starry Banner is Beautiful and decorated in good taste. Very clean ! Charming and Romantic ! The Starry Banner is located in the Manteo Marina at Roanoke Island Festival Park.